FARGO, N.D. (CNS) — On the 75th anniversary of the Tekakwitha Conference, Native American Catholics came together again to review the past, plan for the future and recharge their faith. 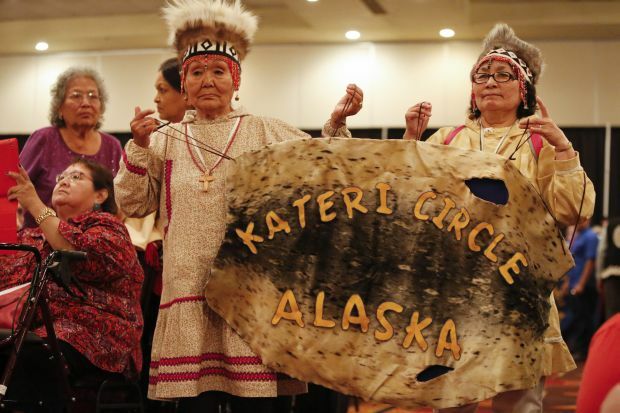 More than 750 people from 35 states and representing 135 tribes gathered under the theme “To walk humbly,” a nod to namesake St. Kateri Tekakwitha, the gentle Mohawk-Algonquin woman canonized two years ago. Gathering in “talking circles” on the conference’s first full day July 24, groups of them agreed that young people were their top concern. Some of the other issues people brought to the floor included expanding evangelization and inculturation efforts and a need for more Native American priests, women religious and lay leaders. One group mentioned a desire for “spiritual healing centers” to help people overcome drug and alcohol addiction problems. The talking circles were facilitated by Father Henry Sands of the Ojibwe, Ottawa and Potawatomi tribes. A priest of the Detroit Archdiocese, he heads the Native American efforts of the Secretariat of Cultural Diversity in the Church for the U.S. Conference of Catholic Bishops. He told the groups that he would share their concerns with the bishops of the United States. Young people were not only on the minds of conference-goers, but they took part in the meeting activities, including leading some Native American rituals. At a sunrise prayer service, a young man conducted the smudging — the Indian purification ritual using the smoke of burning cedar, sage and sweet grass. Carmelita Sharpback of Winnebago, Nebraska, swaddled her 8-week-old daughter, Willow Rain, as she walked in the event’s evening parade of nations with other tribe members. Crow Creek Sioux Jaime Berens of Charter Oak, Iowa, was attending the Tekakwitha Conference for the first time with her 9-year-old daughter, Saige. During the opening Mass, Archbishop Charles J. Chaput of Philadelphia called his fellow Native Americans to continuing Christian conversion. Before his homily Archbishop Chaput also announced some news — that Pope Francis has accepted his invitation to attend the World Meeting of Families in Philadelphia in September 2015. Fawn Antone, 32, of the Tohono O’odham Nation in Pisineno, Arizona, was attending the Tekakwitha Conference with several family members. She said she rarely misses the annual meeting.